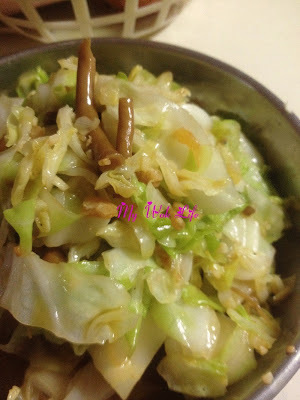 The first dish I cooked using one of the mushrooms was a simple one, the Stir-fried cabbage with Teatree mushrooms. I was contemplating between the Teatree mushrooms or Golden Needle mushrooms, initially, and decided to go with Teatree mushrooms for a change since Golden Needle mushrooms have already been commonly used in vegetable dishes. Moreover, the Golden Needle is spicy flavored and spicy vegetable dish wasn’t my desire at that point of consideration. Otherwise, the Spicy Golden Needle or Spicy Nameko mushrooms would have been a good choice. Well, I knew I have made a great choice. Indeed, the Teatree mushrooms complement well with the cabbage stir fry, and its supplementary flavour did not fail to elevate the taste of my cabbage cooking. Actually, this was not the first cabbage dish I have cooked with mushrooms. In my previous Stir-fried Cabbage recipe, I used Shiitake mushrooms. However, without these flavoured mushrooms, I have to season the dish with more condiments. In another word, I do not have to remember to add many seasoning in my cooking now to make my cabbage dish taste wonderful. 1) Heat wok with oil over medium-high fire. Add in dried shrimps, followed by minced garlic and stir fry till fragrant. 2) Add cabbage and stir fry till soften. Add in oyster sauce and stir fry to mix well. 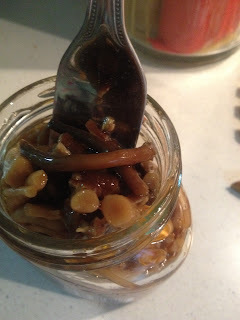 3) Then, empty (or use half of) the bottle of Teatree mushrooms into the cooking, and stir fry for a few seconds. Reduce heat to low-medium fire and cover wok with lid to simmer for another few seconds before heat off. Dish up and serve. A serving of my Stir-Fried Cabbage with Teatree Mushrooms counts about 100kcal. Remember, it’s low fat! Like I said, these are ready-to-eat products. These mushrooms do not require cooking, actually. As the mushrooms are nicely flavoured, they can be consumed straight from the bottle, on their own, or to complement with rice, porridge or noodles. As for me, I like to use it as sides to my cooking. Good thing about it, it can be eaten as vegetarian, and for Muslim friends, it’s Halal-certified. Just FYI, Yifon brand bottled mushrooms come with six interesting flavours and mushroom types i.e. three assorted mushrooms (Button mushroom slices 蘑菇片, Poku mushrooms slices 香菇片, Golden Needle mushrooms aka Enokitake 金针菇), Bailing mushrooms 百灵菇, spicy Bailing mushrooms, spicy Golden Needle Mushrooms, spicy Nameko mushrooms 滑子蘑 and Teatree mushrooms 茶树菇…:) To check out the photos of each mushroom bottle, log in to my FaceBook Fan Club. Tips: These bottled mushrooms are available in major supermarkets e.g. NTUC Fairprice, Shop n Save, Giant Hypermarket, Carrerfour Hypermarket, and etc, if keen to try it. Each bottle is sold at S$1.95 for 170g/bottle.